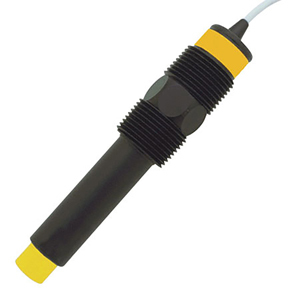 The LVC-152-R capacitance level switch is the perfect switch solution for conductive coating or scaling type liquids. The LVC-152-R is best applied in grounded vessels which contain water based, light to medium coating or scaling type liquids including soap, wastewater and brine solutions. The LVC-152-R capacitance switch detects the presence of liquid or air by measuring the conductive or dielectric values which are present in all materials. The guard circuit rejects the negative effects of coating build-up on the probe by eliminating the coating signal path between the active and reference electrodes. As the probe tip becomes immersed in liquid, the capacitance effect is greatly increased and the switch changes state. Warning: Do not install sensor within 15.24 cm (6") of any metal object. 참고: Comes complete with 3 m (10 ft) cable and operator’s manual. For 7.62 m (25'), add suffix "-25" to model number, add $20 to price. For 15.24 m (50'), add suffix "-50" to model number, add $40 to price.